Lahti is a city and municipality in Finland.Lahti is the capital of the Päijänne Tavastia region. 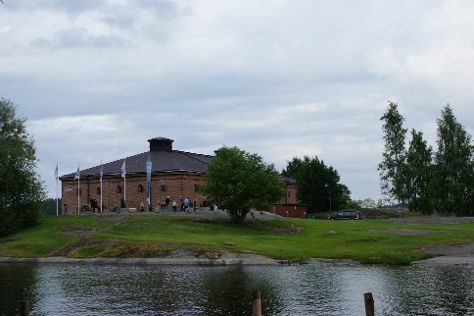 Kick off your visit on the 14th (Tue): take in the waterfront at Vesijärvi harbor. Before you visit Lahti, use our trip planner to discover what you can do and see there. Sao Paulo, Brazil to Lahti is an approximately 25-hour flight. You'll lose 5 hours traveling from Sao Paulo to Lahti due to the time zone difference. Traveling from Sao Paulo in May, expect Lahti to be a bit cooler, temps between 18°C and 6°C. Finish up your sightseeing early on the 15th (Wed) so you can catch the train to Lappeenranta. Start off your visit on the 16th (Thu): take in the architecture and atmosphere at Lauritsala Church, get engrossed in the history at Wolkoff House Museum, then pause for some serene contemplation at Church of the Intercession of the Mother of God, then stop by MyGoodKnife, and finally contemplate in the serene atmosphere at Lappeen Marian kirkko. For reviews, maps, and other tourist information, use the Lappeenranta online travel route planner . You can take a train from Lahti to Lappeenranta in 1.5 hours. Alternatively, you can drive; or take a bus. In May in Lappeenranta, expect temperatures between 18°C during the day and 6°C at night. Finish your sightseeing early on the 16th (Thu) so you can drive to Savonlinna. Kick off your visit on the 17th (Fri): savor the flavors at Savonlinna Market Square, step into the grandiose world of Savonlinna Cathedral, look for gifts at Taito Shop Savonlinna, take in the architecture and atmosphere at Pikkukirkko, then step into the grandiose world of Olavinlinna Castle, and finally examine the collection at Savonlinna Provincial Museum. Discover how to plan a Savonlinna trip in just a few steps with Inspirock's itinerary builder. You can drive from Lappeenranta to Savonlinna in 2.5 hours. Other options are to take a train; or take a bus. May in Savonlinna sees daily highs of 17°C and lows of 4°C at night. Cap off your sightseeing on the 17th (Fri) early enough to go by car to Kuopio. Kuopio is a city and a municipality located in the region of Northern Savonia, Finland. Start off your visit on the 18th (Sat): take in the waterfront at Kuopio Harbor, take in the architecture and atmosphere at St. Nikolaos Cathedral, then see the interesting displays at Kuopion Korttelimuseo, then see the interesting displays at Kulttuurihistoriallinen Museo, and finally test your team's savvy at popular escape rooms. Here are some ideas for day two: enjoy breathtaking views from Puijo Tower, take in the architecture and atmosphere at Lutheran Cathedral, admire the natural beauty at Snellman Park, then see the interesting displays at RIISA - Orthodox Church Museum of Finland, and finally contemplate the waterfront views at Valkeisenlampi. For reviews, photos, ratings, and other tourist information, read our Kuopio travel planning website . Drive from Savonlinna to Kuopio in 2.5 hours. Alternatively, you can do a combination of bus and train; or take a bus. In May, daytime highs in Kuopio are 16°C, while nighttime lows are 5°C. Finish up your sightseeing early on the 19th (Sun) so you can catch the train to Jyvaskyla. Jyväskylä is a city and municipality in Finland and in the western part of the Finnish Lakeland. Start off your visit on the 20th (Mon): test your problem-solving skills at popular escape rooms, examine the collection at The Craft Museum of Finland, then view the masterpieces at Kuokkalan kartano, then get a new perspective on nature at Natural History Museum of Central Finland, and finally go for a walk through Tourujoen luontopolku. To find photos, traveler tips, ratings, and other tourist information, you can read our Jyvaskyla trip itinerary planner . You can take a train from Kuopio to Jyvaskyla in 2 hours. Other options are to take a bus; or drive. In May, daily temperatures in Jyvaskyla can reach 17°C, while at night they dip to 3°C. Finish your sightseeing early on the 20th (Mon) to allow enough time to take a train to Tampere. Do some cultural sightseeing at Museo Militaria and The Finnish Labour Museum Werstas. Do your shopping at Tallipihan Suklaapuoti and Galleria Ronga. When in Tampere, make a side trip to see Birthplace of Jean Sibelius in Haemeenlinna, approximately 1h 15 min away. see Sarkanniemi Theme Park. Next up on the itinerary: relax and rejuvenate at some of the top local wellness centers, admire the masterpieces at Maltinranta Artcenter, examine the collection at Vapriikin Museokeskus, and take in the architecture and atmosphere at Church of St. Alexander Nevsky and St. Nicholas. To see traveler tips, photos, reviews, and other tourist information, use the Tampere route maker app . Take a train from Jyvaskyla to Tampere in 2 hours. Alternatively, you can drive. In May in Tampere, expect temperatures between 17°C during the day and 4°C at night. Finish your sightseeing early on the 24th (Fri) so you can travel back home.